Ever wanted to play on a gambling platform that accepts Bitcoin but isn’t a full-fledged casino at the same time? Just want to play some mini-games without going through the tedious process of depositing great amounts of money just to get a bonus full of shady requirements that are almost impossible to clear? If your answer to all those questions was “Yes” then you should go on and read our Bitsler bitcoin casino review as this might prove to be the most suitable place you can visit and start gambling on every little game you like. Let’s see if this site is as good as the majority of the internet user’s say it is. As soon as you visit the website you will be prompted to create a user and you can do that simply by proceeding to input your preferred username. As soon as you do that you are good to go and enter the full site. You will be redirected to the main game of the site which is a variation of the renowned mini-game called DICE. On the left side of the site, you will find the navigation bar and at the right hand a small live chat window. There are four games available on Bitsler. These are DICE, Roulette, Multicolor, CaraYCruz. The DICE game is by far the most popular mini-game using cryptocurrencies currently in the online gambling industry. The interface is relatively simple. First, you input the desired amount of Bitcoin (or any other cryptocurrency) you want to bet with, the minimum bet being as little as 1 Satoshi. If you didn’t already know Satoshi is the smallest denomination of Bitcoin as it is actually equivalent to 0.00000001 BTC. The maximum is determined at how much you would win in case you rolled successfully. The maximum payout is 10BTC. Then you must alter your chances of winning. You first set the percentage of winning. If you set it to 70% then the possible payout would also change to become smaller. You can also set whether you want to roll under or over the specific number generated based on your chance of winning. You can also set the system to wager automatically. If you want to do that just select the number of rolls and the amount of Bitcoin you want to be. You can also set the game to run continuously until you either lose all your coins or reach a specific amount that you have set. You could even set whether you would like the bet to automatically increase or decrease based on whether you are winning or not. We gave DICE a test. We set it to run 100 times at 95% chance of winning and the results were amazing. Not only did we win but we lost only 3 times has a 97% winning rolls. Then we tried it again with 75% winning chance and we won 71 out of the 100 times. Based on that you can see for yourself that the system is fair and truly rolls the dice based on chance. At the time of this writing, the Roulette isn’t currently available, probably due to possible fixes or alterations, but Bitsler states that “The roulette come back soon”. Out of all four games on Bitsler, this one has to be the most fun and yet the most difficult one to win. It is a variation of the roulette. You get a wheel which is divided into 25 parts. There are 5 colours on the wheel. These are Black (Dark Gray), Red, Green, Yellow, and Blue. There are only 1 black part and 6 ones for each of the other 4 remaining colours. The black part has a yellow star on it, and in case you have bet and land on Black then you will win a percentage of the jackpot. However, there are some specific things that apply, like the one stating that you can’t win the jackpot if the outcome is beneath 1BTC as well as many other restrictions and rules. Each part has a different number on it. This is the multiplier on your winnings. 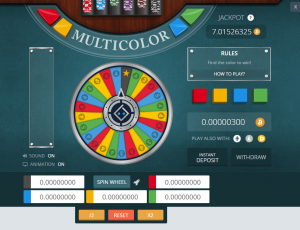 You can bet a specific amount to whichever colour (s) you want to and then you click on the “Spin Wheel” button. If you land on a colour that you bet on you will earn your initial bet multiplied by the number displayed on the winning part. 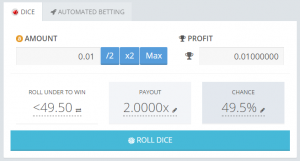 Just like the DICE game you can set the system to run and wager automatically as well as when to increase or decrease the betting amount. This game is a bit odd. You can select up to 3 of the total 4 possible outcomes. Place your bet and play. It’s a three coins flip. If you have bet on the right combination, then you will multiply your winnings based on how many outcomes you selected. Just as in all the other games offered on Bitsler you can set the game to run automatically as well as to alter the betting amounts based on whether you win or lose. Instead of giving players a deposit bonus Bitsler will let you get some coins for free up to 20 times per day. Each time they will provide you with 150 Satoshi. Remember that you can exchange these amounts of Bitcoin to an equivalent amount of any of the other supported cryptocurrencies. The site accepts five cryptocurrencies. You can use Bitcoin, Ethereum, Litecoin, Dogecoin, and Burst. All deposits and withdraws can be made with Bitcoin. Through the exchanger, you can set the amount of any cryptocurrency you want and get the equivalent of any other one. Every time you deposit you can use three possible methods. You could either scan the barcode to automatically select the address of your account to deposit money in. You can also do it manually or use altcoins. All deposits will require a transaction fee which you can set yourself. You should know. However, that depending on how big or small it is will determine the time needed to get it authorised. Withdraws always come with a prefixed 0.0004BTC transaction fee. The customer support operates 24/7. You can contact them either via live chat for direct communication or create a ticket, and they will get back to you as soon as possible. Bitsler: Who Is This Casino Good For? This casino is suitable for anyone wanting to have some fun no matter how small or significant the amount the user wants to bet is. Bitsler is a place for everyone regardless of how big your pocket is. There is a dedicated app for mobile devices that you could use to easily access and play all the games on Bitsler’s platform. We have reached the end of our Bitsler bitcoin casino review and we can easily say that what goes around on reviews of its users posted on the Internet is completely true. 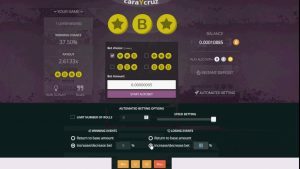 An amazing mini-game cryptocurrency gambling platform which is suitable for everyone looking to have some fun even if they are completely out of cash. Make sure that you check them out. Now go sign up on their site and give their games a try. Who knows? You may even win the jackpot. Read more about The Benefits Of Using Bitcoin With An Online Casino. How To Play A Poker Tournament?